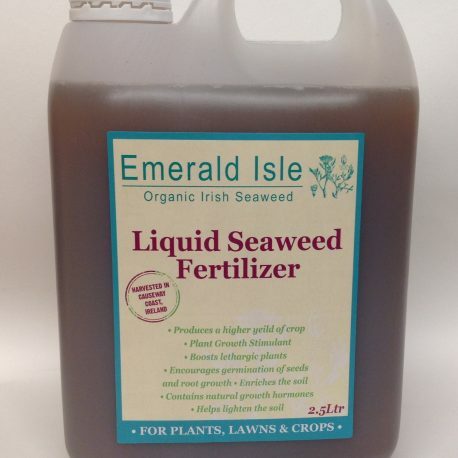 Emerald Isle Seaweed Organic Seaweed Liquid Fertilizer 20 Litres. 4 x 5 litres containers. 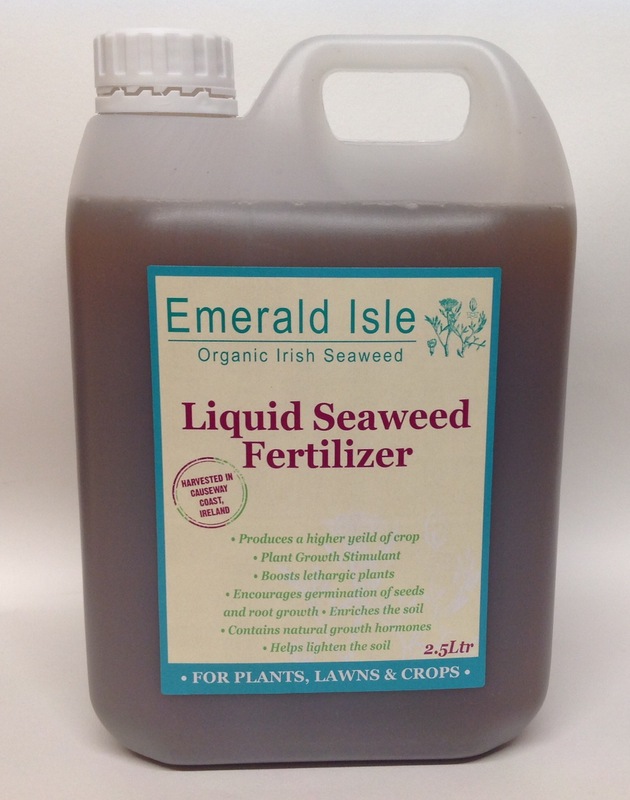 Organic kelp liquid fertilizer for plants, lawns, golf courses and crops. Organic kelp liquid fertilizer is a completely natural, organic product and has a source of over 70 vitamins and minerals (nothing else added). Organic kelp fertilizer can be applied to any type of soil or plant without concern for waste by-products or harmful chemicals, leading to healthier crop yields and general plant well being. Kelp seaweed was traditionally used as a fertilizer and spread on these lands from the 18th century. All seaweed has be harvested in the Causeway Coast of Ireland. 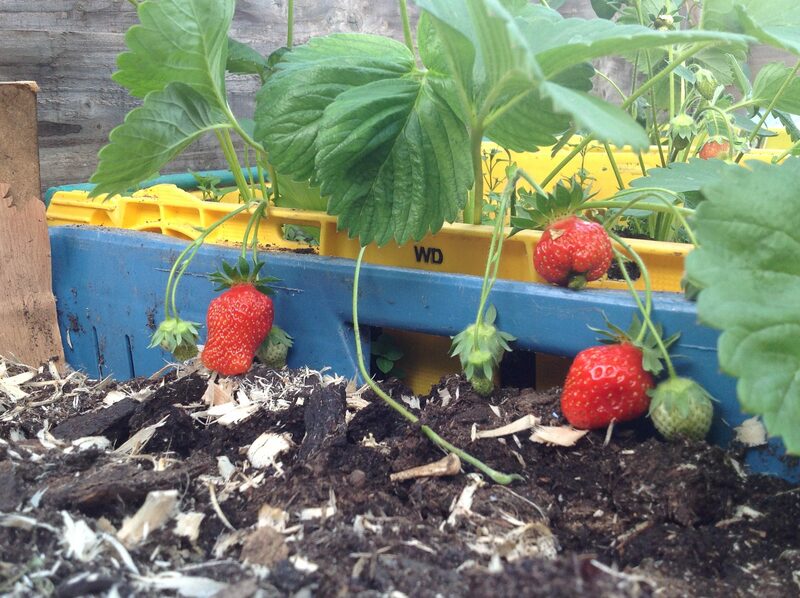 Repels slugs and other pests. Applied to pasture crops increases the nutrient uptake, the protein content, and overall quality of the crop. At Emerald Isle Seaweeds we only use a cold extraction process . Other seaweed fertilisers on the market use chemicals to extract the seaweed liquid, this can adversely affect and alter the natural composition of the seaweed and reduce its nutritional goodness. Because of soil depletion from unsustainable farming practices, most whole foods are lacking in sufficient mineral levels necessary for human health. 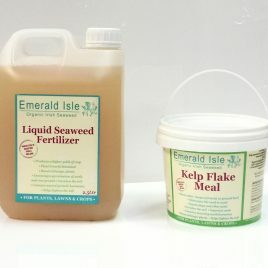 Kelp seaweed liquid content helps to bind soil crumbs together. 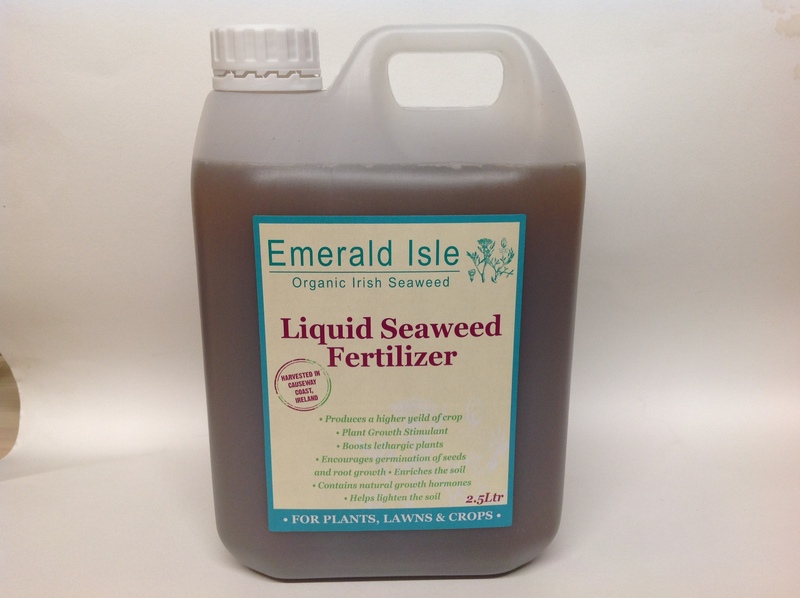 Kelp fertilizer contains all soil nutrients plus a full range of trace elements and amino acids. Best used as a foliar spray on the plants leaves and lawns. Soft fruits: 25ml – 5L once a week. Apples pears 30ml- 5L once a week. Vegetables: 10ml – 5L once a fortnight. Flower beds 10ml – 5L once a week. 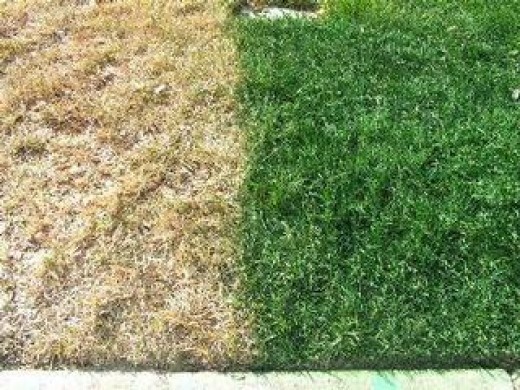 Lawns 1:50 every two weeks (for two months). 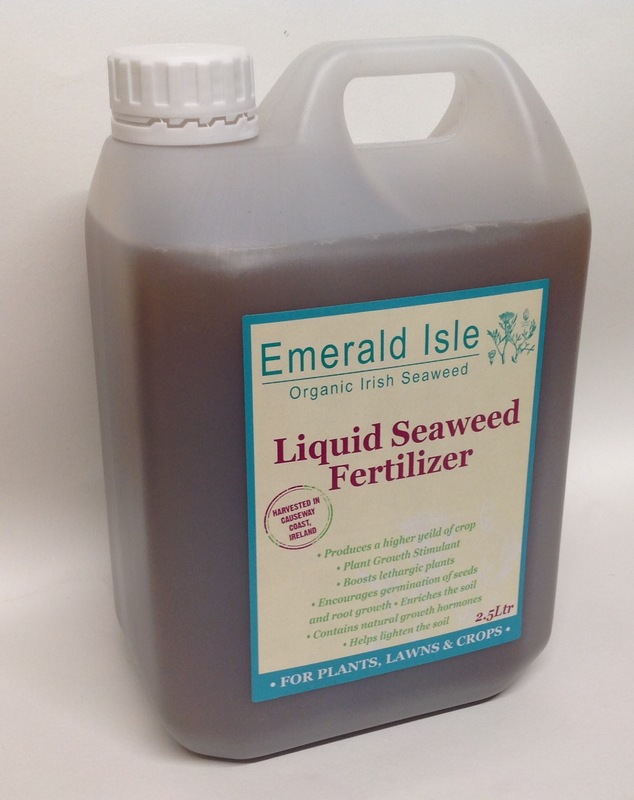 Germination of seeds and root growth: soak in the seaweed for 10-12 hours 5ml-5L. Help extend the shelf life of fruits and vegetables spray eight days before harvesting. For golf courses and lawns use 5 Litres per acre every 4 weeks diluted with water during summer months. Our seaweed has undergone a full range of thorough tests which include chemical, pesticides, water content, and nutrition. All Seaweed tests have be done in laboratory conditions and is UKAS accredited. HACCP control system in place. For more information on seaweed liquid please see research on the link below. Kelp seaweed capsules are a completely natural, organic product and a source of over 70 vitamins and minerals, with nothing added. We treat our seaweed in an entirely natural way, hand harvested, hand dried and chopped. No chemicals or any other substance is used in production. No microwave, or any harmful process is undertake. 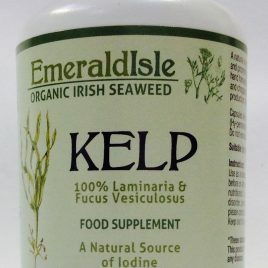 “Like all sea vegetables, kelp seaweed capsules provide minerals found in sea water, especially iodine and trace minerals that may be lacking in our depleted soils. For Westerners unaccustomed to including seaweed in the diet, a small daily supplement of kelp, in tablet or powdered form is a good idea, but don’t overdo -excess iodine may also cause thyroid problems.” Sally Fallon and Mary G Enig PhD ; Nourishing Traditions Cookbook. Health and nutrition claims from the EU commission. Iodine contributes to the maintenance of normal skin.